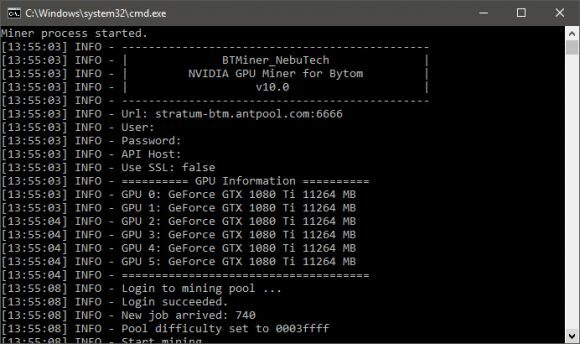 Another update for the NebuTech BTMiner Nvidia GPU miner to version 10.0 for mining Bytom (BTM) that brings another significant performance boost by increasing the hashrate provided by the miner with about 30% or even more compared to the previous version 9.0, depending on what kind of Nvidia GPUs you have in your mining rig of course and the settings they are running at. Anyway, this is a really big performance boost to the miner, so if you are mining Bytom (BTM) with your Nvidia GPU mining rigs you must definitely update to the latest version to take advantage of the increased hashrate. We remind you that the NebuTech BTMiner is a closed source Bytom (BTM) GPU miner for Nvidia CUDA that is available for both Windows and Linux operating systems and it has a 3% developer fee built-in.